Das Ebook The Swift Programming Language (Swift 4.2 beta) von Apple Inc. wurde am 09.06.2015 veröffentlicht und platzierte sich erstmals am 05.06.2018 auf Platz 23 der myCharts365 Top-100-Ebook-Charts. 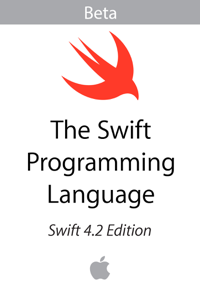 Die bisher beste Platzierung erreichte das Ebook The Swift Programming Language (Swift 4.2 beta) von Apple Inc. mit dem 13. Platz am 06.06.2018, die aktuell letztmalige Platzierung in den myCharts365 Top-100-Ebook-Charts erreichte es am 17.09.2018 mit Platz 54. Damit war The Swift Programming Language (Swift 4.2 beta) von Apple Inc. bisher insgesamt 77 Tage in den myCharts365 Top-100-Ebook-Charts vertreten. Swift is a new programming language for creating iOS, OS X, watchOS, and tvOS apps. Swift builds on the best of C and Objective-C, without the constraints of C compatibility. Swift adopts safe programming patterns and adds modern features to make programming easier, more flexible, and more fun. Swift’s clean slate, backed by the mature and much-loved Cocoa and Cocoa Touch frameworks, is an opportunity to reimagine how software development works. This book provides: - A tour of the language. - A detailed guide delving into each language feature. - A formal reference for the language.